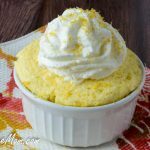 Sugar Free Lemon Mug Cake made low carb, gluten free, and a single serving for perfect portion control! 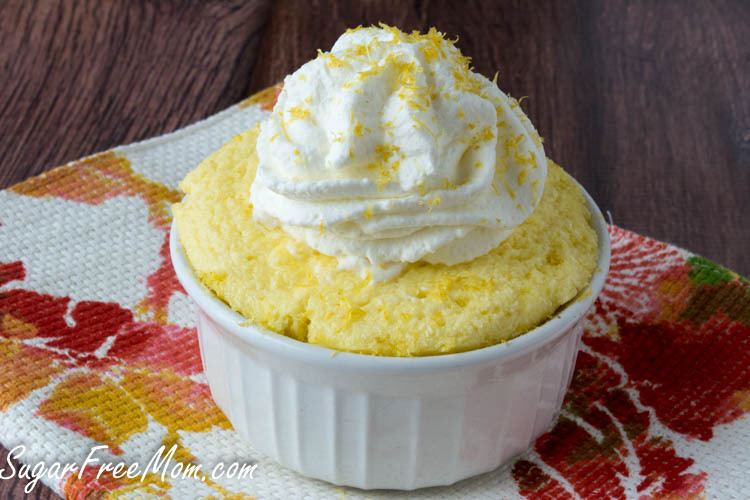 This easy lemon mug cake is perfect for when you just want a single serving and not have any left overs in the house. It’s gluten free, grain free, tree nut free and absolutely lemony! If you live in New England or any place that has had frigid temperatures and a whole lot of snow over the last couple of months, you can be certain we are all ready for the spring season! I am a lemon lover truth be told. Love them in my water, seltzer and in recipes as much as possible like this Sugar-Free Frozen Lemonade, this Strawberry Lemon Sorbet, and these delicious No Bake Lemon Cheesecake bars! Spring time for me means lots of fresh produce and ingredients. The aromatic smell of lemons remind me of spring no matter what season it is. They’re just so fresh; I always feel rejuvenated when I can get my daily whiff. I have even been known to ingest the juice of an entire lemon as a shot to help cure a sore throat. Might sound harsh, but I can tell you it works better than anything I’ve ever tried. I’ve made this recipe 4 times before posting it. I am always looking for the perfect and moistest first bite. I tried with different combinations of coconut four, one time with some flax seed, then 2 eggs, then more lemon, but finally what I’m sharing is the best combination. Not too much lemon, just enough. Perfectly soft in texture. And I can honestly say even if you are not a coconut fan you’ll love this. My littlest man hates all things coconut and loved this cake! The coconut is not noticeable at all, the lemon is the star, I promise! This recipe was first posted in March of 2015, but I felt a little video was in order! Here’s my easy video for you! You can make this dairy free by replacing the heavy cream with canned coconut cream. You can use any sweetener of choice if you don’t like stevia, but if you’ve never tried it, I can guarantee you will love the lemon stevia in this recipe. This is a 7 ounce ramekin. 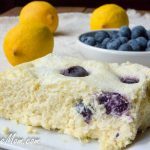 Other Lemony Recipes: Lemon Cheesecake Mousse, Lemon Custard Pie, Crock Pot Lemon Blueberry Cake. Pour batter evenly into two 7 ounce ramekins. Microwave 1 minute to 30 seconds for each or until toothpick in center comes out clean. 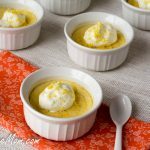 Sugar Free Lemon Pudding Cakes from the Sugar-Free Mom Cookbook! I think you’re making this 4x assured perfection, because it looks to me as if you’ve achieved it! I love lemon desserts and lemon any thing. A lovely burst of spring in this lemon mug cake, Brenda! I am a huge lemon lover and this looks completely dreamy, Brenda! 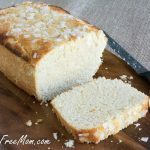 I am allergic to coconut.Is there another flour that would work in this recipe? Any gluten free flour would work. I am a lemon lover, through and through, though have never tried that cure for a sore throat. I’ll have to try that one! 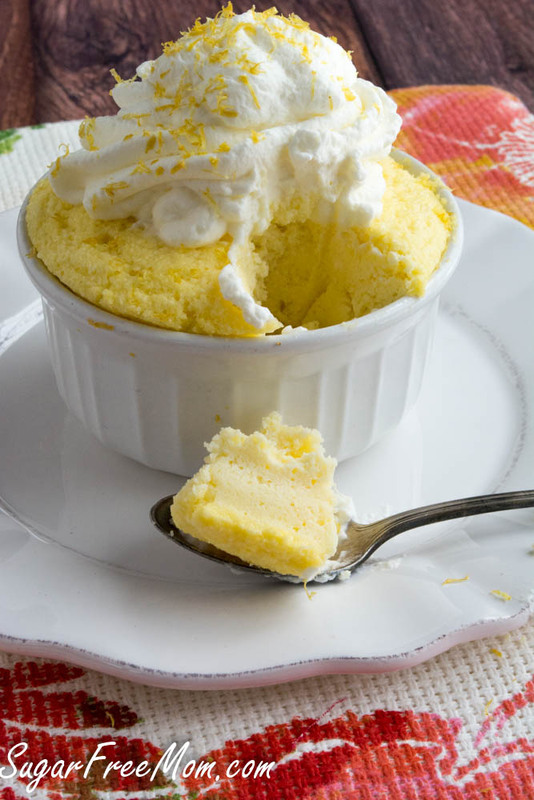 This mug cake looks like the perfect dessert for springtime. I’m allergic to egg. Can I use a flax egg instead? I don’t see why not although I’ve not tried it. If you do, please come back and let me know how it was. I Love your recipes! my only comment/request is that you include fiber! esp since you are sugar free, it is important to know how much fiber is in there to subtract from the carbs if you carb count. thank you! Hi Sarah, not sure why you mention it because every single recipe has nutrition info and fiber is included in all of my recipes. I also all ready wrote the net carbs in the notes of the recipe. 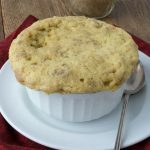 This might be my favorite mug cake of yours…and I’ve been loving all of them! It screams spring and I’m ready! Can I use lemon juice instead of lemon extract in this ? I’m sorry I thought I was still on the lemon pound cake. So my question should be posted on that page please. You mean 4X to perfection! This is my kind mug cake! I also love the nutritional info too! Means I can have it! I love lemon desserts SO much. I have never made a mug cake…I think this is the perfect one for me to start with. Looks so delicious! Why thank you! I am a lemon lover too. I have never made a mug cake and this one looks like a great way to bring in the spring. I’m a huge lemon fan. As I write this, I’m sipping on my warm lemon water. It’s a great way to start the day. Your lemon mug cake looks so pretty. I love the light yellow color. Plus it looks incredibly light in texture too. A winner for sure. Pinning! I just had to make this right away after I saw this recipe. Love anything lemon. So disappointed that I did not have any coconut flour left after I had the other ingredients, so I used spelt flour and it turned out great. I liked it a lot. Since I never made it with coconut flour, I cannot vouch for that. But will definitely make this often and next time I have coconut flour, will make it that way too. Thanks for sharing your substitute! I’m so over winter and am more than ready for all things lemon! This cake looks really tasty. I think I’ll ty it for dessert tonight! I am definitely a lemon lover! And you can’t beat 4 minutes with a dessert! the prettiest mug cake i have ever laid eyes on! There is nothing more cheery than lemon in everything at the end of a long winter. I’ve never made a mug cake before, but this one looks divine! I am a serious lemon lover so this one is right up my alley. I think it’s that time of year where we’re so over winter, all of us are craving citrus, hoping it jump starts spring. I can’t wait for sunshine. Delicious!! Short list of ingredients = my kind of recipe 😉 I’m thinking breakfast tomorrow morning!! I love that you can use coconut cream instead of regular cream. Is there any way to make this in larger version? Don’t have any heavy cream on hand right now, anything else I could use? I’m sure it would still be tasty using milk or even coconut cream from the can. This looks heavenly what if I don’t have liquid lemon stevia? Use any sweetener you like. I *have* to make this Today. I don’t have a microwave. How long would I bake it in a 350(?) oven? I would guess just 15 minutes then check in center with a toothpick. I’m so glad Monica asked ..and you answered.. I’m so wanting to try this (and will tonight), but I don’t use my microwave. Aafter seeing a demonstration of two plants, treated exactly the same except one was watered with tap water and the other with microwaved (then cooled, of course) water. Will never forget the picture of that poor plant that got the microwaved water. So, now I can very happily make this as suggested, in the oven. Can I make this cake without the liquid lemon stevia? I have THM sweet blend and wondered if that would work. I can’t wait to try this ca,e!! I’m sure you could but I don’t use THM blend so not sure how much you should use. I don’t use microwaves anymore, can they be baked in a convection oven? This is delicious! Very lemony, light & fluffy. I will be saving this one for sure. i am enjoying this cake right now and it is the BEST MUG CAKE EVER!! it is SUPER moist and decadent. i made a cream cheese frosting and added lemon zest to it. thank you so much. this is now my go-to afternoon snack! oh and i also used a 1/2 packet of powdered stevia since i dont have any liquid. Just found this and it looks delicious! Way too sweet for me! Did I read it right? 1/2 teaspoon liquid lemon stevia? I’m going to try it again with a lot less stevia because it is very moist light and easy! Thanks! depends on which brand of liquid stevia you have. If you are using NuNaturals, it’s much sweeter in comaparison to Sweetleaf. This was fabulous! I never comment on these things but I had to let you know it was truly delicious 🙂 thank you for sharing .I will be using this often! My husband is a lemon fanatic. I surprised him with this tonight and he loves it. Thank you for another great recipe. So happy he liked it! This recipe is magnificent. I made one tonight as I was craving a snack and I wanted something a bit sweet. It was absolutely perfect! I think you could bake it at 350 F for 15 minutes, but i’ve not tried it so keep an eye on it. I love lemon…I need to make this tomorrow! This is my first time to your site…thank you for posting all the nutrition facts! I made it tonight and it was bitter. Odd after taste. I used liquid lemon stevia sweetleaf just like the instructions said and I couldnt finish it. I loved the texture and concept but am new to going sugar free. I’ve cut sugar out completely from my diet. So I wanted to try a couple of treats now that I’ve been without sugar altogether for a few months now. Is it just something you get used to or should I tweak it a different way. I would love to make my little boy one but he has an egg allerggy. Any suggestions on a substitute? Maybe a flax egg? Sorry I’ve not tried it without the egg. I absolutely love the beautiful pictures you provide of your creations. They are so appealing. So glad to have found you on facebook,. You can use plain stevia that will be fine. could I replace the cream with coconut cream? and if I want to bake it – how long? You can. 350 degrees for 15 min-20min, check in center with toothpick. This lemon mug cake is delicious. Thank you so much for the recipe. I tried this today and was very pleased with the results. I did not have the lemon stevia and so used regular liquid stevia and added a bit of lemon extract. I also added a bit of lemon zest. 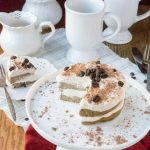 I topped it with whipped cream sweetened with Gentle Sweet and it was divine! I ate the whole thing but honestly, it would easily have made 2 servings. Thanks so much! I am new to mug cakes and what a great concept as so many times when I make desserts, I am eating them for days because my husband and family prefers sugar desserts. This is great! Liquid lemon stevia- really? I wish just once I could look at one of these recipes and NOT have to order some obscure ingredient off the internet. Just had it, life saver after carb cravings. Thanks for your great recipes. This looks divine!!!!!! I found this recipe on Pinterest and I HAVE to try it! A few questions though, 1) what kind of dish should I use to bake it ? 2) could I use another citrus, such as lime or orange? I used a 7 ounce ramekin. Yes another citrus is fine. I just made this dessert and it is fabulous. I love the fact that you can make it in under ten minutes from start to finish. I topped it off with homemade whipped cream and fed it to my husband. He loves it. Thanks again for another yummy dessert. My Mom always gave us hot lemonade to sip on when we were sick and/or a sore throat. Always worked. Yum! Best mug cake yet, great texture. This is so luscious. I had a little set of creme brule wide and flat (only about an inch high rim) ramekin/crock dealios that hold exactly 8 oz water. I thought they’d be so cute to serve this elegant and lemony cakette. I was askeert they would run over the edge in their rise. No no no they did not overflow and they are so dang cute not to mention lemon-tasty! I had to make a well in the center and pour in organic heavy cream. Omgosh! It’s nothing short of lemon heaven! Thank you so much for sharing and for your innovative creativity. I always enjoy your email selection of recipes. I appreciate your time! A well in the center after baking. I don`t know which coconut floor you used, but this 2 tablespoon contains 13,9 carbohydrates! I used coconut floor which contains carbohydrates as much as 17 gram in 100 g. 2 tablespoon cannot possibly weight over 100 gram, guess 16-20 gram. Your video shows your ramekin is greased but your written recipe does not tell you to grease your dish. Would be nice to add since I tried making mine in a mug and was planning on cooking in the mug but wondered where the oil is. Otherwise, great recipe! Just ran across your recipe & had to make it NOW!!!!! Even at 10:30 pm! Used unsweetened Almond milk vs. the cream. Came out wonderful & with even LESS fat & calories! Topped it with fresh blueberries. YUM! Yum!!! 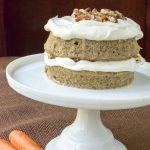 I used sour cream instead of cream (I had some in the fridge that needed using up) and used 2tsp of Sugarless stevia organic granules instead of liquid stevia, the cake was really delicious, just what I needed to satisfy my dessert cravings! Hi I have to make 200 mini cupcakes, can this be done in little muffin tins? Love this delightful recipe. Used a large ramakin, greased. Instead of lemon stevia liquid I used juice and finely grated zest of half a large lemon and teaspoon of granulated erythritol/stevia. Might try lime next time. Served warm with double cream. Yum. Glad to hear thank you! I have been following your blog in the past year since completely changing my food habits and lifestyle. In the last year I’ve lost over 120 pounds and am only 8 away from my personal goal. Your blog has given me so much hope and helped me realize that I can live healthy life without feeling like I have to give up “treats” forever. I just made this for myself and OH MY WORD! SOOOOOO amazing! I didn’t use lemon stevia (I don’t have any flavored stevia) and I added 1/2 a tablespoon of skim ricotta. I also made a lemon glaze with 1 tablespoon powdered swerve and 1/2 tablespoon lemon juice. And ate this cake with fresh blackberries and strawberries. With the little bit of ricotta it made it soooo fluffy and almost reminiscent of a cheesecake! Thank you for all you do and for providing recipes that are simple, delicious, and don’t taste like you’re making sacrifices. This has been a hard year for me but your recipes have helped to make it a transformative experience. THANK YOU! In a few months I’ll be posting a bunch of the recipes that I’ve enjoyed this year on my personal blog and this one will definitely be on the list! I just made this and was pleasantly surprised at the texture. I usually don’t like coconut flour or mug cakes for that matter. They always seem to be very very dry and with a texture that I don’t like. I really enjoyed this little cake. The texture reminds me of shortbread…and I love that. Hi, I am looking for a great sugar free dessert to make for a friend’s birthday. I think I found it! My question is can I make this ahead of time or does it need to be served immediately after baking? My experience with mug cakes is tjat they get a litle chewy after they start to cool down. Actually I personally think it tastes even better after being refrigerated overnight. Definitely not chewy you’ll find it very moist. I made this last night but didn’t work out for me, was very rubbery that could be as I didn’t have any coconut flour or lemon liquid stevia. How can I change to a non gluten free recipe ? What flour did you use? I wanted to love this! My husband wanted this tonight, well I decided to try it before tonight. I did not like it. It taste of coconut not lemon. And it was not sweet at all, I mean not even a little. I dont crave sweets anymore since on keto but wow this was not at all something I would make again. Sorry. 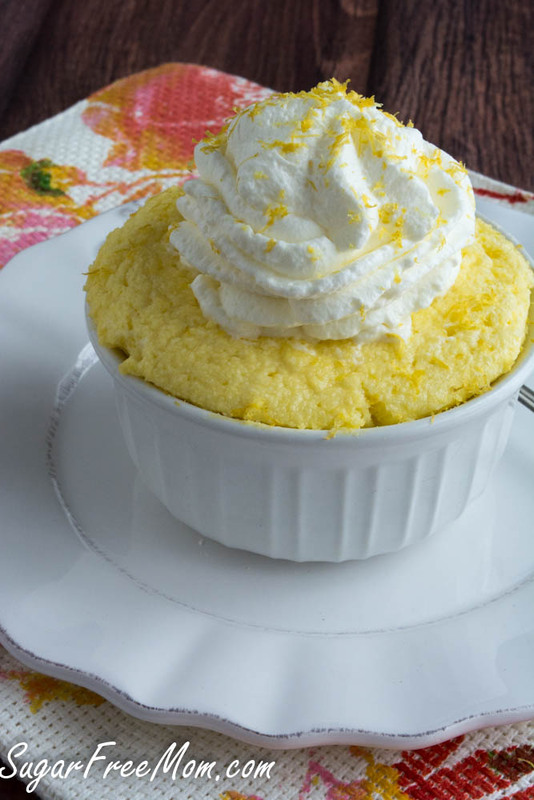 A huge and delighted thank you for this LEMON mug cake recipe! After making my family an apple-based dessert yesterday, and actually during a hunt for a cranberry mug variation (thanks I’ve bookmarked that, too), LEMON struck me with a massive craving! Whipped this up, put it in the freezer just long enough to make whipped cream for everyone and…omg! YUM! Going to make another one tonight! LEMON just might be my new chocolate!!! Btw coincidence two Theresa commenters back-to-back… I’m the 2nd one! Just made it again!!!! Thank you again! This was amazing, the perfect amount of tart to a touch of sweet!! Your recipes don’t disappoint, thank you.